This one just in from the Pathetically Obvious Truths Department: Time magazine has, in its most recent issue, discovered that, as far as immigrants go, there is no “No Correlation With Crime”. I know: “Hey Lovato, chill out; We need these kinds of victories however small and obvious they may be.” And those of you who’d tell me this would be right. But it is, I believe, a measure of how deep the swamp of immigration politics is that we -and our adversaries- define the parameters of what constitutes a “victory”. It’s like those of us on the immigrant rights front have been so beaten down by the anti-migrant political moment that we adopt a Pavlovian approach to happiness: the absence or minimization of sadness and pain. OK. Thanks for hearing the rant. This piece from Time is actually a very important article, one we should be use as we push the anti-migrant boulder up the mountain of fear. And, despite it all, I really am ready and looking forward to looking down that mountain towards the verdant (verde que te quiero verde) Valley of Hope, a valley that was there long before the well-meaning gentrifyers from Obamamania showed up and tried to buy up land that predates and runs deeper than their suburbs and dorms. I spent a lot of time walking through a Noreaster today and could hear the sprinkles of spring in the air. This article from Bloomberg talks about another indicator of the decline of U.S. power in the hemisphere: rising Latin currencies. Oddly enough, Latin America (yes) is home to three of the four best-performing currencies against the dollar this year among emerging markets. Most interesting thing in tonight’s debate? I thought that the most interesting development was the discussion around the border fence, better known as “El Muro de La Muerte” (The Wall of Death). Asked about their previous votes for the infamous wall, both Obama and Clinton backed away from their votes. CLINTON: And having been along the border for the last week or so — in fact, last night I was at the University of Texas at Brownsville — and this is how absurd this has become under the Bush administration. Because, you know, there is a smart way to protect our borders, and there is a dumb way to protect our borders. This is the kind of absurdity that we’re getting from this administration. I know it because I’ve been fighting with them about the northern border. Their imposition of passports and other kinds of burdens are separating people from families, interfering with business and commerce, the movement of goods and people. So what I’ve said is that I would say, wait a minute, we need to review this. There may be places where a physical barrier is appropriate. OBAMA: Well, this is an area where Senator Clinton and I almost entirely agree. I think that the key is to consult with local communities, whether it’s on the commercial interests or the environmental stakes of creating any kind of barrier. And the Bush administration is not real good at listening. That’s not what they do well. And so I will reverse that policy. As Senator Clinton indicated, there may be areas where it makes sense to have some fencing. But for the most part, having border patrolled, surveillance, deploying effective technology, that’s going to be the better approach. Their change of vote and mind says much about the rapid rise of Latino electoral power this year. No one, not even most Latino pundits, had any idea of the force with which Latinos entered this election. And, unless he wants to further push the Republican party into the desert of Latino voter backlash, John McCain will not be able to exploit the Democrat’s Border Flip-Flop. The Arizona Senator who supported and then rejected legalization already has some immigration flip-flopping of his own to deal with. This little story in L.A.’s Daily Breeze community newspaper previews a big trend: the Latinization of the criminal justice system. According to the piece by the Breeze’s Rachel Uranga, a majority of L.A.’s infamous LAPD – those inovative guys who brought you SWAT, the Rodney King incident (L.A. Riots too) and Rampart, the greatest police scandal in U.S. history-has taken another historic lead by having force that’s majority Latino. Another stunning reflection of the demographic momento? Yes. But good for justice……..probablemente no. 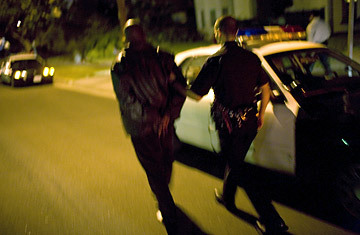 For reasons like those outlined here, this browning of (in)justice means that the work of protecting the property and interests of the corporate and individual elites will now be carried out by brown men in bloody blue uniforms; it means that the hand gracefully swinging the baton atop the head of a poor or young person will be browner; it means that a new class of Latino paramilitary elites will oversee a system that is jailing blacks and, now, Latinos with Soviet-like ferocity. So save your “Si se puede” and other tired cliches for the presidential candidates who refuse to talk about why an exponentially-growing number of our kids ride the express train from cradle to prison. A new report to the to a United Nations human rights committee criticizes the U.S. government for its “abysmal” treatment of African Americans, immigrants and other racial and ethnic groups. 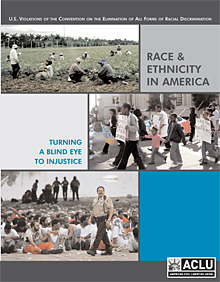 The report by the American Civil Liberties Union (ACLU) was delivered to the United Nations’ Committee on the Elimination of Racial Discrimination (CERD) in response to a ” flawed U.S. government report that underreported the state of racial discrimination in the United States.” CERD is a U.N.-sanctioned group of internationally recognized human rights experts that oversees compliance with a 2004 treaty on the elimination of racial discrimination. Since the Clinton Administration ratified the treaty in 1994, the U.S. government has used CERD to denounce racism and other discrimination in other countries. Witnesses joining the ACLU for testimony before CERD in Geneva will include Akif Rahman, a native-born United States citizen who was detained, questioned and abused by the Department of Homeland Security (DHS) on five separate occasions as he re-entered the country after business or personal trips abroad. The importance of such reports cannot be underestimated. One of the largely unwritten chapters of civil rights history is about how more internationalist and left-leaning African Americans like WEB Dubois and Paul Robeson used international forums to shame the U.S. government before its peers about Jim Crow. Declassified documents from numerous national security archives reveal that officials at the highest levels of government were, in fact, concerned about the international embarrassment brought on them by such acts of outing. The ACLU report also provides a healthy antidote to the dangerous absurdity of the “post-racial” talk on the left and right side the Obamamania wave. For these and other reasons, it’s important for social movements to pressure Obama to use his abundant rhetorical gifts to speak about things in the report. The screenshot above documents another example of how immigration “humor” gets used to sell things. The Kayak.com post promotes what it calls a “semi-illegal vacation” designed to “push travel boundaries just enough to cause a little commotion” by having travelers pose as undocumented immigrants. Well, they appear to have succeeded. Not long after this post went up, groups like the Bay Area Immigrant Rights Coalition (BAIRC), the Center for American Progress (CAP) and other groups and individuals gave Kayak several gigs and earfuls of complaints, forcing them to remove the post because of what representatives called “complaints”, according to folks at CAP. This type of exoticism marks but another in the long line of insipid and goofy gimmicks that fetishize non-white Others for fun and profit, as mentioned here & here previously. My advice to the racial thrillride seekers? Go ride the empty kayak of your suburban self. Thanks to folks at BAIRC & CAP for bringing this to our attention. As part of its “Stop the Hate” campaign, the National Council of La Raza recently led production of the video below, which talks about the links between organized hate groups and anti-immigrant spokespeople -Minutemen Jim Gilchrist & Chris Simcox, FAIR’s Dan Stein and others – featured on mainstream newscasts. The video and campaign come as welcome news from NCLR, which lost much credibility for its enthusiastic support of the nomination (and then silence about the numerous scandals) of disgraced former Attorney General Alberto Gonzales. But another video in the “Stop the Hate” series is not as welcome. Prominently featured in the “Code Words of Hate” video is a spokesperson for the Anti-Defamation League (ADL), a group that has a history of aiding and abetting police spying on African American, progressive, Latino and other groups. Some of us, for example, recall how the ADL presented “human rights” awards to such questionable figures as former Salvadoran President Calderon Sol, who had to wipe the blood from his hands before receiving the ADL award and giving a grandiloquent speech about the ethereal beauty of human rights. Still, the NCLR campaign is an important one that takes on issues -racial code words, media, hate groups, language, etc.-we’ve discussed here at great length. So, we should support the campaign. Exit polls taken by CNN appear to indicate that Illinois Senator Barack Obama swept primaries in Delaware, Washington D.C. and Virginia with by winning the votes of a broad majority of voters, including Latino voters in Virginia. Hillary Clinton appears to have won the majority of Latino votes in Maryland. According to the CNN polls, Obama won the majority of the Latino vote in Virginia a margin of 53% to 47% . Speech: National Security and the Birth of the Anti-Immigrant State or Immigrants and the Birth of the National Security State? And now for something that deviates from but is directly related to the election mania gripping the country. This speech given at the Brecht Forum captures well some recent thoughts about the relationship between immigrants and the national security state. Basic idea is that immigrants provide the state with another excuse to put more people with guns in our midst, especially in times of crisis. The speech goes against the traditional logic around immigration, which tells us that raids, repressive laws, etc. are solely about elections or about controlling low wage undocumented workers needed for corporate and private profits. While winning elections and keeping a surplus of low wage labor are a part of the immigration equation, these explanations hardly capture the cavernous motives beneath the current immigrant zeitgeist. Stuff in the speech also runs contrary to the rather tired argument that what’s happening around immigration is just about immigrants. It’s also about controlling people like many of you and me, citizens. Lurking beneath the stale arguments of pro and anti-immigrant forces is a nation state, an elite that’s preparing for the social unrest due to the death of the American Dream (if it ever actually existed). I shared a 2 minute clip of the speech previously, but this link features the speech in its entirety (14 minutes).Hope you like it. I actually think it’s one of the better talks I’ve given in some time. Please do email me or comment if you listen to this as these ideas are a work in progress and I value your thoughts and opinions about it. And thanks to the Brecht Forum and the folks at Law and Disorder Radio for the opportunity to share these thoughts. After burning the 3am oil trying to get a grasp on the ultimately ineffable workings of the body politic, I got up at 5:30 am (can you hear the roosters?) to join Democracy Now‘s Amy Goodman and guests Bill Fletcher and Frances Fox for an out-of-the-corporate-media box discussion about race, empire and the primaries. Thanks to Amy and fellow panelists, this really turned out to be as probing a discussion about the elections as I’ve had the pleasure of participating in. Check it out! Asked on Super Duper Tuesday to choose between a black candidate, Barack Obama, and a white candidate, Hillary Clinton, Latinos chose both -and neither. Preliminary results of the most intense primary in recent memory indicate that predictions of a monolithic Latino “firewall” for Clinton have fallen short. The candidates split key Latino states in different parts of the country. Clinton won states like New York and New Jersey while Obama won states like Colorado and Illinois. Exit poll results also demolished widely-held notions that Latinos are unwilling to support a black candidate. Obama succeeded in dropping Clinton’s Latino advantage from 4-1 (68% to 17% according to a CNN poll conducted last week) to 3-2 last night. And in almost every Latino-heavy state that voted Super Tuesday, Obama received more than the 26 percent of the Latino vote he got in Nevada just 2 weeks ago. In what appears to be the development of a Latino voter regionalism, the vote varied depending on what part of the country (and in some cases what part of a state) the vote was cast. For example, while Clinton secured 74% of the Latino vote in her home state of New York, available data also indicates that Obama won 59% of the 30-44 year olds, the largest age bloc, in his home state of Illinois’ Latino electorate. Obama won important Latino votes – and delegates- in Colorado, Arizona and other states where Clinton was expected to overwhelm him. With the support of New Jersey Senator Bob Menendez and other members of the Latino political machine nurtured by her husband, the former President, Clinton won more than 60% of the Latino electorate in states like New Jersey and New York. And regardless of the final tallies in California, the Latino electorate has already proven to be a powerful, new and greatly misunderstood segment of the no longer solely black and white electorate of the United States. “The big enchilada will be Texas, followed by mid-sized states where Latinos are about 5% of the vote, states like Pennsylvania, Ohio, Maryland and Washington” said Gonzalez. “It’s going to continue to be very interesting” said a smiling Gonzalez. “On the one hand,” he added, “Latinos are clearly trending towards Obama who overcame a 27 point difference nationally. But, on the other hand, Clinton still won several states with (Latino) margins of more than 50%.” If estimates of a 61 to 38 percent Latino advantage for Clinton hold and if the trend, especially the youthful Latino trend, favoring Obama continues, understanding the fluidity of the very racially and ethnically diverse Latino electorate will be mission critical to success well into November’s general election. 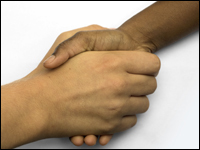 NPR Interview: Is There Really a Black/Latino Divide? Would that we lived in a world with more journalists like Farai Chideya, the consequential host of NPR’s News and Notes. Guest Earl Ofari Hutchison, Congresswoman Maxine Waters and yours truly joined Farai in this brief, but quite cool deconstruction of the categories “Latino” and “Black/Latino divide”. Something to think about while we await the results of the most racialized election in U.S. history, an election in which historic Latino participation heralds the beginning of the end of the “Black/white electorate”.